Alison Gottlieb passed the National Veterinary Technician exam and also the Emergency Critical Care boards sponsored by the Veterinary Emergency and Critical Care Society (VECCS). 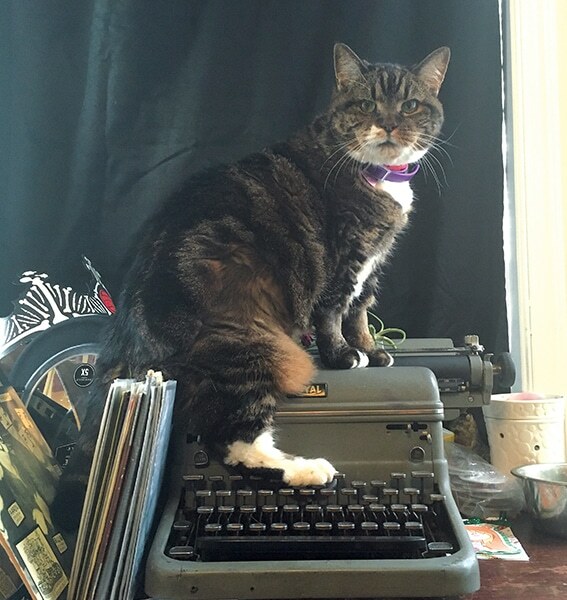 Her career began at Cat Hospital At Towson (CHAT) where her passion for cats bloomed. Alison was part of the health care team at the Veterinary Referral Center in Little Falls, New Jersey, serving Senior ICU Nurse. She was also responsible for training new technicians at the hospital, through lectures and hands-on experience. Ali has served on various boards and professional committees, giving lectures and speeches on her work in the ER/ICU. She is also co-founder of Four Paws Consulting LLC, which focuses on technician education. In recent years, veterinary medicine has made great strides in the treatment of chronic pain in cats. Twenty-plus years ago, painful procedures were performed with chemical restraint alone and without consideration of analgesia or the patient’s pain level. The veterinary paradigm has shifted from questioning whether animals feel pain to recognizing and treating their pain. 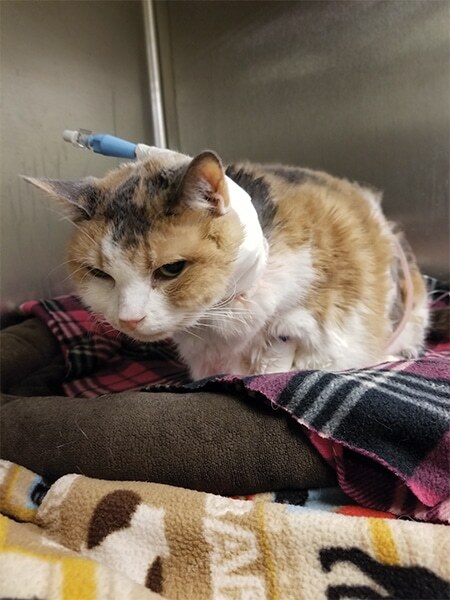 While significant strides have been made in veterinary analgesia in general, one area has lagged behind: chronic feline pain. Some of the obstacles for treating such pain include difficulty recognizing it, cats’ unique metabolism, difficult drug delivery, fear of adverse effects, and ultimately a lack of data regarding the analgesic options for cats. For many of the pain medications used in both cats and dogs, research has focused primarily (if not exclusively) on their use in dogs, requiring most drugs to be prescribed off label to the feline patient.1 Additionally, cats are living longer,2 and older ages increase the need for appropriate and varied treatment options for painful cats. FIGURE 1. A cat after cruciate surgery is at risk for chronic pain associated with injury and surgery. 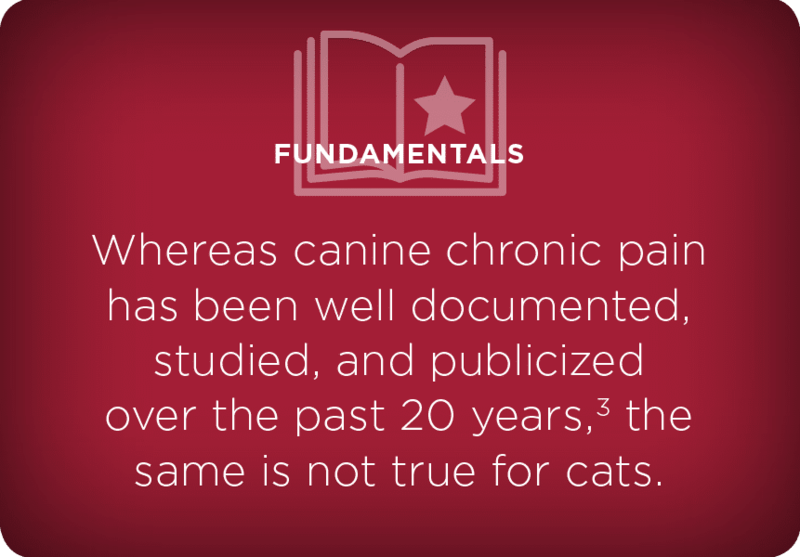 Recognizing chronic pain in cats is challenging. Acute surgical and traumatic pain is accompanied by visual and anthropomorphic cues that trigger addressing analgesia; for example, incisions, inflammation, or bleeding all look like they hurt (FIGURES 1 and 2). Such prompts are not always discernible with chronic conditions or neuropathic pain. Many common afflictions in cats result in chronic pain — veterinary colleagues have identified some, while others can be assumed to be painful. Osteoarthritis, chronic dermatitis, interstitial cystitis/urologic syndromes, oral disease, and ocular disorders tend to be accompanied by few overt clinical signs but can cause chronic pain. FIGURE 2. Post abdominal surgery indicators of pain include unwillingness to lie down, narrowing of the eyes, and head-down position. Additional analgesia is needed. The first step in alleviating feline pain is recognizing it. 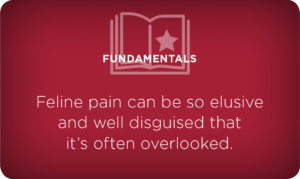 Difficulties in recognition include a lack of prompts/triggers, lack of data connecting different maladies with pain levels, and the often obscure nature of clinical signs associated with neuropathic pain. Adding to this complicated list is the fact that cats often try to hide pain, especially in the presence of humans and other animals.9 Although this assists with their survival in the wild, pain-masking behavior is a hindrance to proper treatment, if any is provided at all. 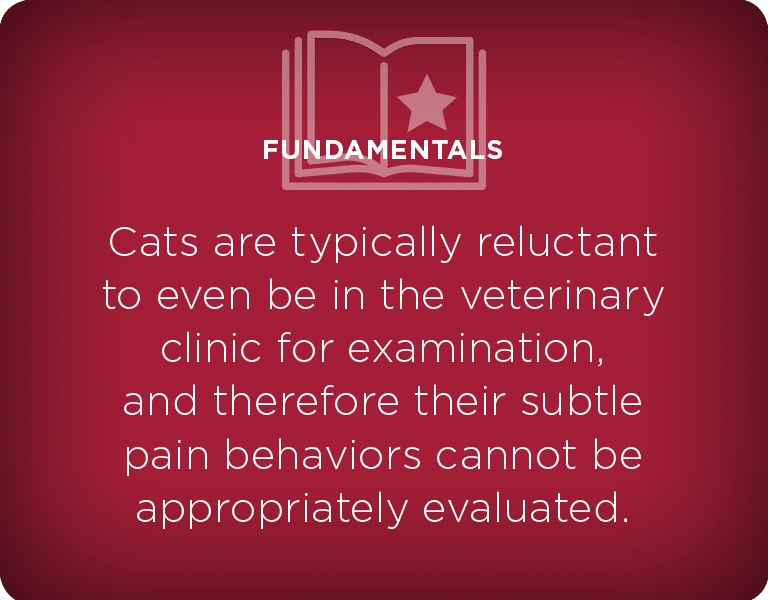 Cats are typically reluctant to even be in the veterinary clinic for examination and, therefore, their subtle pain behaviors cannot be appropriately evaluated. This makes pain recognition and diagnosis more arduous.5 In such scenarios, the cat’s owner must be the facilitator in recognizing and treating chronic pain.10 These difficulties in pain recognition — particularly in the clinic setting — means that veterinary professionals must rely on owners and their experiences with their cats as a significant component of a comprehensive pain treatment model. Clinical signs and changes in behavior associated with chronic pain in cats can be subtle and are often mistakenly attributed to their age.10 Owners and even veterinary professionals may inadvertently attribute behavior changes to age or common age-related issues rather than to chronic pain caused something else. Signs of chronic pain can include decreased grooming resulting in a greasy, clumped, or matted hair; the opposite — obsessive grooming — can likewise signify feline pain. A reluctance to jump onto furniture or countertops could be a sign of chronic pain, as could inappropriate urination/defecation; the latter is often quickly attributed to age and thus overlooked.10 Weight loss or a reluctance to eat dry food can be a sign of oral pain. Less obvious signs of pain include changes in sleep patterns, hiding, behavioral issues and aggression, an overall decrease in appetite, and an objection to being brushed or stroked.11 The signs cats may display when they are experiencing pain are widely varied and vague and, even when present, do not provide much information as to the source or cause of the pain. Cats are private about displaying chronic pain. Often, initiating treatment can be a trustworthy method to solidify a diagnosis. Profound improvement after a given pain treatment can positively confirm that pain had been present. Treatment of chronic pain in cats should be multimodal,11 consisting of a combination of environmental and lifestyle changes, pharmacologic interventions, and alternative therapies. A cat with musculoskeletal or arthritic pain can benefit from a combination of treatment and lifestyle changes, while employing only one form of treatment may not provide in significant relief. Including weight loss as part of a multimodal intervention for chronic pain has been shown to significantly reduce musculoskeletal and arthritic pain in people and dogs; the same is true for cats.12 Weight loss not only reduces the stress on joints but can improve mobility. Therefore, one aspect of treatment for this type of pain is environmental: controlling caloric intake by offering fewer high-calorie treats, eliminating table scraps from the diet, and changing the cat’s diet to a reduced-calorie product.10 Providing cat owners with a copy of a body condition score to take home helps provide a visual guide they can share with other caretakers. Small amounts of controlled activity also can help keep muscles and joints active and moving in cats with pain of this nature.10 Playing with laser pointers, feathers, and toys on strings can strengthen joints and muscles, which will leave the cat less vulnerable to pain while simultaneously improving the bond between the owner and the patient. Additional environmental changes should be geared toward improving comfort and accessibility. Adding steps or ramps can help the cat reach favored elevated spots without having to jump.11 Providing a larger litter box with low sides for easy access may resolve inappropriate elimination issues. Well-padded bedding and/or heated beds can lessen pain and increase comfort and thus may quickly become favorite sleeping spots. Massage therapy, passive joint manipulation and stretching, and underwater treadmill activity can all help alleviate pain, depending on the cat’s temperament and willingness to be involved in these activities.13 Alternative therapies such as acupuncture and homeopathic remedies may be helpful in lessening chronic pain as long as the therapy does not cause undue stress. 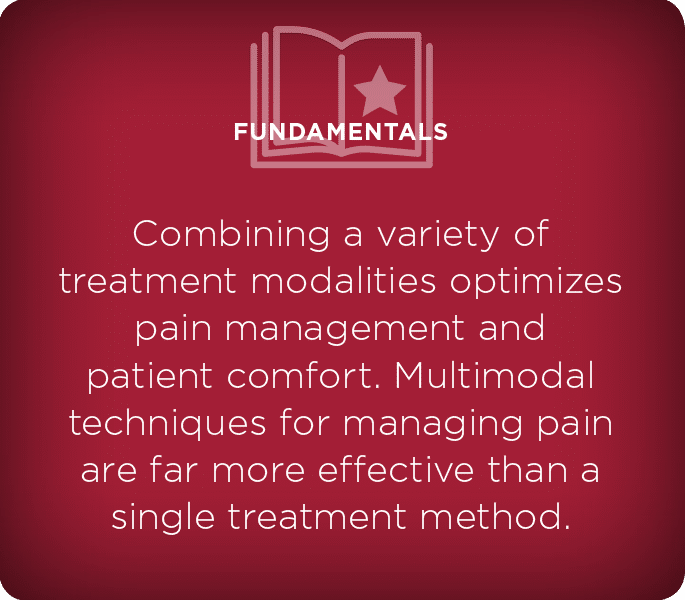 Combining a variety of treatment modalities optimizes pain management and patient comfort. 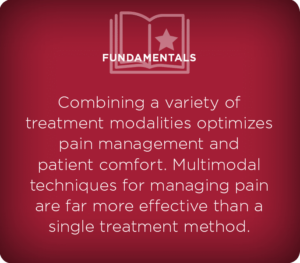 Multimodal techniques for managing pain are far more effective than a single treatment method. Even if the severity, source, cause, or exact nature of the pain is not fully diagnosed —a common situation in cats —it is often best to cast a wide net and employ a variety of treatments to help relieve pain. Satisfactory pain management was achieved. There were no obvious side effects during the period of administration. Gabapentin is very effective as a pharmacologic element of multimodal analgesia in patients with chronic pain. The recommended dose for cats and dogs starts at 2 to 10 mg/kg PO q8–12h and may be increased to 50 mg/kg PO q8gh.8 The veterinarian should re-evaluate patients every 5 to 7 days for potential dose increases. Tricyclic antidepressants, such as amitriptyline, have been used with success as treatment for some types of pain in cats. Amitriptyline blocks norepinephrine and serotonin reuptake, inhibiting the pain pathway. Given at doses lower than those used for depression in humans with chronic pain,18 this class of medication has few side effects and is readily available. The off-label veterinary dose ranges from 1 to 2 mg/kg PO q24h.7 Again, detecting pain in cats is extremely difficult, and pain may present as such behavioral problems as over-grooming and inappropriate urination, which is why these antidepressants have positive results on the cats’ signs. Long-term use of nonsteroidal anti-inflammatory drugs (NSAIDs) in cats is controversial. Currently in the United States, no NSAIDs are labeled for ongoing use in cats. However, quality of life also is important to consider, and thus, severe unrelenting pain may take precedence over potential adverse events. Buprenorphine is a partial mu opioid agonist. It binds to mu receptors but has only partial clinical effects, making it appropriate for mild to moderate pain, but not severe pain. However, there is good evidence, at least in cats, that analgesic dosages are much higher than described in earlier studies. An increased dose of (0.01-0.04 mg/kg IV) provide improved and longer lasting analgesia, not less.21 Buprenorphine was thought to have a ceiling effect, this is when a medication has reached its maximal response. In this case, increasing the dose does not enhance the effectiveness. The pH of buprenorphine is very similar to that of the saliva of cats. This makes the drug effective when the injectable formulation is delivered oral transmucosal (OTM) in the cat, therefore increasing the ability to send the medication home with the painful feline patient. Chronic daily use is recommended only for severe or neoplastic pain. Tramadol, an atypical opioid drug, weakly binds to mu receptors. Over the years the efficacy and dose have been scrutinized and the usefulness and dosing of tramadol have been reevaluated. The activity of tramadol is thought to be attributed to a metabolite O-desmethyltramadol, known as M1. Studies in humans demonstrate that the metabolite is necessary for tramadol to be effective as an analgesic, but research has recently shown that it is a very minor metabolite in dogs. Therefore, Tramadol is not an effective analgesic agent for dogs. Humans and cats produce enough M1 to trigger opioid-like analgesia. Recommended doses in cats are 1 to 2 mg/kg PO q12–24.11 Tramadol has a bitter taste that may make administering it to cats difficult and compounding often does not mask the severe bitterness. Drug interaction and dysphoria are other potential problems associated with using tramadol; both may be related to serotonin syndrome. Combining tramadol with selective serotonin reuptake inhibitors (SSRI), monoamine oxidase inhibitors (MAOI), and tricyclic antidepressants should be avoided. Tramadol may lower the seizure threshold and therefore should be used cautiously in animals prone to seizures, such as patients with epilepsy. Glucocorticoids can have significant systemic side effects, and evidence has shown that long-term use for neoplastic or uncontrollable pain may promote cartilage degeneration, thereby exacerbating arthritis. However, because quality of life needs to be considered in some severe cases, chronic or neoplastic pain may be improved by administering these drugs. In 2016 Colorado State University (CSU) completed a study on safety, toxicity, and pharmacokinetics of cannabidiol in healthy dogs. The outcome of this study established that the compound was measurable in the blood and safe for use. Additional clinical trials investigating the use of hemp-derived cannabidiol for osteoarthritis and seizure disorders are now underway at CSU. This is also a very promising area for veterinary pain management, and as research continues its uses are sure to expand. 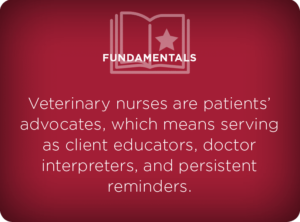 Veterinary technicians are patients’ advocates, which means serving as client educators, doctor interpreters, and persistent reminders. 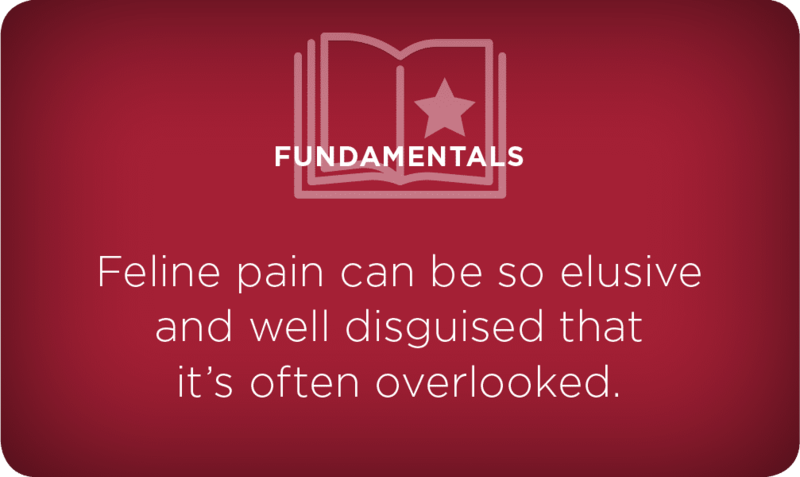 Feline pain can be so elusive and well disguised that it’s often overlooked. 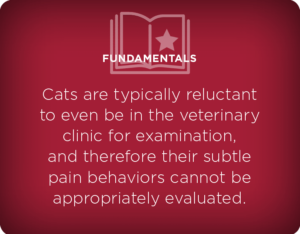 Educating clients on detecting pain in their cats is a collaborative effort that begins with client education about behaviors associated with pain and the need to be on the lookout for pain cues at home. Veterinary technicians are often the “detective” when it comes to feline pain. They should inform the veterinarian about specific behaviors described by owners and ask if such behavior might be indicative of pain; if so, the next step is to discuss whether some type of analgesia should be considered. FIGURE 4. George (left) and Waffles (right) bonding after perineal urethrostomy surgery. As a veterinary professional and pet owner, I witnessed profound behavioral changes caused by pain in my cat, George. 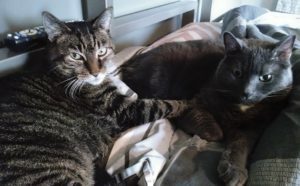 George had lower urinary tract disease and his discomfort led to aggression with one of my other cats, Waffles. George subsequently underwent a perineal urethrostomy to decrease his urinary tribulations. Immediately after surgery and until the end of Waffles’ life, George and Waffles were the best of friends (FIGURE 4). This case acts as an overwhelming reminder to assess for and rule out pain as a source of behavioral issues. As veterinary technicians, we need to be aware of all the options that the veterinarian may discuss with an owner so we can reinforce that information and better educate clients about the benefits of following the recommended multimodal approach to feline chronic pain. Because most pain medications are used off-label in cats, clients need to be reminded to look for adverse events and to immediately report any to the veterinarian. Sometimes, chronic pain does not become obvious until the cat has become so debilitated that no treatment can restore an acceptable quality of life. When that happens, it is necessary to discuss euthanasia for humane reasons. If chronic pain interferes with quality of life, the staff needs to serve as the patient’s guardian and bring up this difficult topic. Gaynor JS. Muir WW. Handbook of Veterinary Pain Management 3rd ED., St. Louis, MO: Mosby: 2014 p. 493. Results of the 2006 AVMA survey of companion animal ownership in US pet-owning households. Allison J. Shepherd/Journal of the American Veterinary Medical Association Mar 2008, 232(5), 695 – 696. Clinical Trial Of Treatments For Osteoarthritis In Dogs. JAVMA 2007; 230:514 – 521. D Lascelles, SA Robertson. DJD-Associated Pain in Cats. Journal of Feline Medicine and Surgery. 2010; 12(3);200 – 212. D Bennett, S Mariam, Z Ariffin, P Johnston. Osteoarthritis in the cat. Journal of Feline Medicine and Surgery. 2012; 14(1); 65 – 75. NK Martell-Moran, M Solano, HGG Townsend. Pain and adverse behavior in declawed cats. Journal of Feline Medicine and Surgery, 2017; http://journals.sagepub.com/doi/10.1177/1098612X17705044#articleCitationDownloadContainer (accessed March 14, 2018). Gaynor JS, Muir WW. Handbook Of Veterinary Pain Management. 3rd Edition. St. Louis, MO: Mosby; 2014. Robertson SA, D Lascelles. Long-Term Pain in Cats. Journal of Feline Medicine and Surgery. 2010; 12(3);188 – 199. ME Epstein, I Rodan, G Griffenhagen, J Kadrlik, MC Petty, SA Robertson, W Simpson. 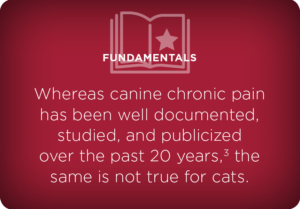 2015 AAHA/AAFP Pain Management Guidelines for Dogs and Cats Journal of Feline Medicine and Surgery, 2015; 17(3); 251 – 272. Robertson S. Managing Pain in Feline Patients. Veterinary Clinics of North America, Small Animal Practice/Update on management of Pain.11/2008; 38(6): 1267 – 1283. Marshall WG, Hazewinkel HAW, Mullen D, DE Meyer, Baert K, Carmichael A. The effect of weight loss on lameness in obese dogs with osteoarthritis. Vet Res Commun (2010) 34:241 – 253. Ortel S, Goldberg ME, Conarton L, Koudelka K, Downing R. The Veterinary Technician in Alternative Therapies. 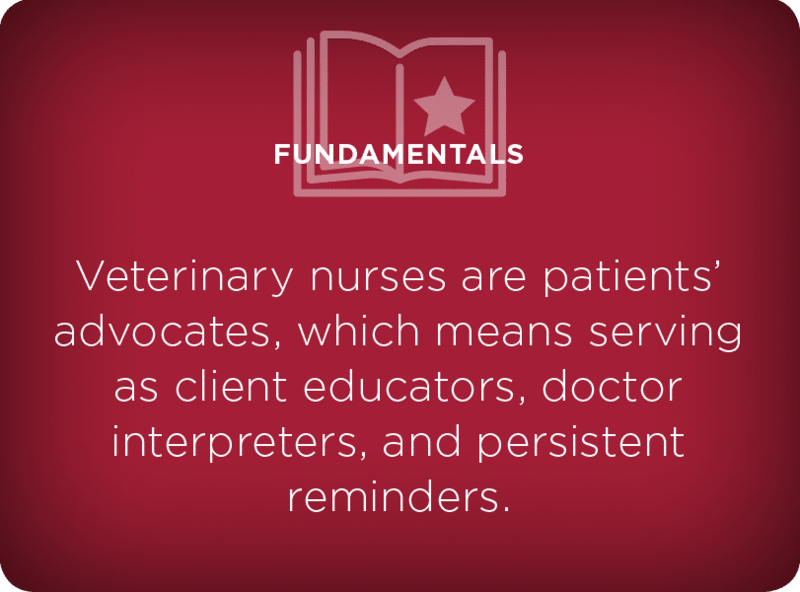 In Pain Management For Veterinary Technicians and Nurses. Iowa: Wiley Blackwell, 2015; 309 – 328. U. Krotscheck, T. Todhunter. The Pathogenesis of Hip Dysplasia. Mechanisms of Disease in Small Animal Surgery, 3rd Ed., Teton New Media, WY, 2016; np. Burns KM. Nutritional Considerations for Pain Management in Dogs and Cats. In Pain Management For Veterinary Technicians and Nurses. Iowa: Wiley Blackwell, 201; 309 – 328. Lascalles D, Robertson SA. DJD-Associated Pain in Cats, What Can We Do to Promote Patient Comfort? Journal of Feline Medicine and Surgery, 2010; 12(3); 200 – 212. Lorenz ND, Comerford EJ, Iff, I. Long-Term Use of Gabapentin for Musculoskeletal Disease and Trauma in Three Cats, Journal of Feline Medicine and Surgery, 2012; 15(6); 507 – 512. Knotkova H, Pappagallo M. Adjuvant Analgesics. Med Clin North Am. 2007 Jan;91(1):113-24. King JN, King S, Budsberg SC, Lascelles D, Bienhoff SE, Roycroft LM Roberts ES. Clinical safety of robenacoxib in feline osteoarthritis: results of a randomized, blinded, placebo-controlled clinical trial. Journal of Feline Medicine and Surgery, 2016; 18(8); 632 – 642. Lascelles BD, Gaynor JS, Smith ES, Amantadine in a multimodal analgesic regimen for alleviation of refractory osteoarthritis pain in dogs. J Vet Intern Med 2008; 22: 53–59. Steagall PV, Mantovani FB, Taylor PM, et al. Dose-related antinociceptive effects of intravenous buprenorphine in cats. Vet J 2009; 182:203–209. Gruen ME, Thomson AE, Griffith EH, et al. A feline-specific anti-nerve growth factor antibody improves mobility in cats with degenerative joint disease–associated pain: A pilot proof of concept study. J Vet Intern Med 2016;30(4):1138–1148. Black LL, Gaynor J, Adams C, Dhupa S, Sams A, Taylor R, Harman S, Harman R, Gingrich D. Effect of Intraarticular Injection of Autologous Adipose-Derived Mesenchymal Stem and Regenerative Cells on Clinical Signs of Chronic Osteoarthritis of the Elbow Joint in Dogs. Veterinary Therapeutics; 9(3) Fall 2008. Arzi B, Mills-Ko E, Verstraete FJ, et al. Therapeutic efficacy of fresh, autologous mesenchymal stem cells for severe refractory gingivostomatitis in cats. Stem Cells Transl Med 2016;5(1):75-86. Abrams, D, Couey, P, Shade, SB, Kelly, ME, Benowitz, NL, Cannabinoid-opioid interaction in chronic pain. 2011. Clin Pharmacol Ther 90(6):844-851. Kogan LR, Hellyer, PW, Robinson NG. Consumers’ Perceptions of Hemp Products for Animals. JAHVMA. 2016; 42(Spring). Plumb DC. Plumb’s Veterinary Drug Handbook. Iowa: Wiley Blackwell, 39. Which of the following is the main obstacle in treating chronic feline pain? Which of the following statements is true about osteoarthritis in cats? Osteoarthritis in cats is rare. Cats with osteoarthritis are often lame. Osteoarthritis is not obvious on radiographs. Osteoarthritis is cats is treatable. Which of the following is a concern when administering gabapentin? It has a very bitter taste, making it unplatable to cats. Some human formulations contain xylitol, which can be toxic in cats. It can cause loss of appetite. It cannot be used in conjunction with other pain medications. Chronic feline pain must be diagnosed to be treated. Not safe for chronic use. Safe and effective for feline pain. Being studied currently at Colorado State University. directly cause renal disease in cats. are all used off label in cats. should never be used chronically. can be used chronically for severe pain if risks outweigh benefits.